72" x 90" and 90" x 108" (Cover photo shows the 90" x 108" quilt). This log cabin variation gets a rounded effect by using different sized strips in the piecing. 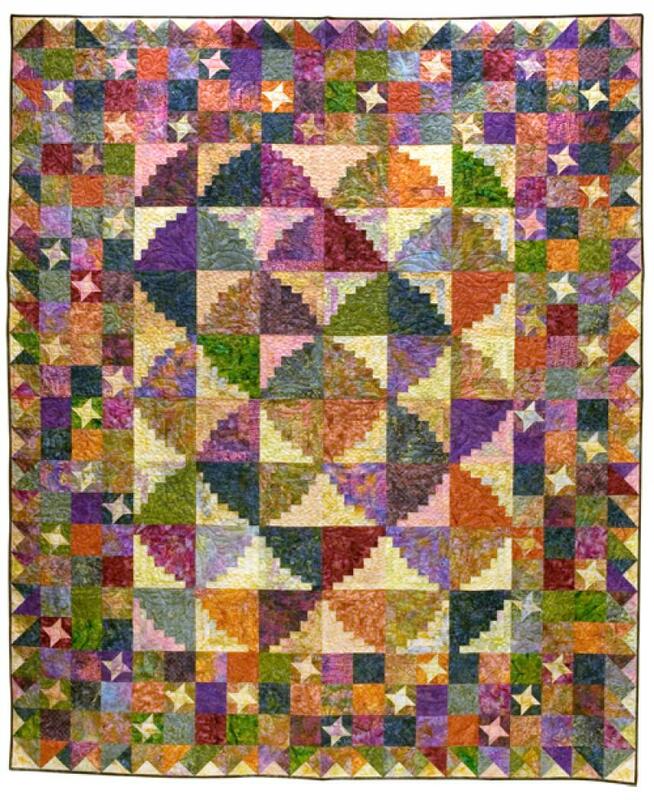 The quilt just seems to dance with little stars twinkling througout the fun pieced border. The pattern offers 2 different sizes, both using an assortment of 24 Dark prints. Remember that Dark is relative. Your Dark prints could be pastels or brights! They just need to contrast with your Background. Select the Dark prints from 3 or 4 color families. Some variation in value is fine. You need 3/8 yard each for the small quilt or 1/2 yard each for the large quilt. You'll also need 8 Background prints. The Background prints also can (but don't have to) vary slightly in value. Either size takes 1/2 yard each of the Backgrounds. We've also included optional instructions for cutting the Dark prints from your stash. Recommended notions: 1-1/2" half-square triangle paper.